Step 1.With your fabric folded double, cut two (2) identical large slightly tapered rectangles. 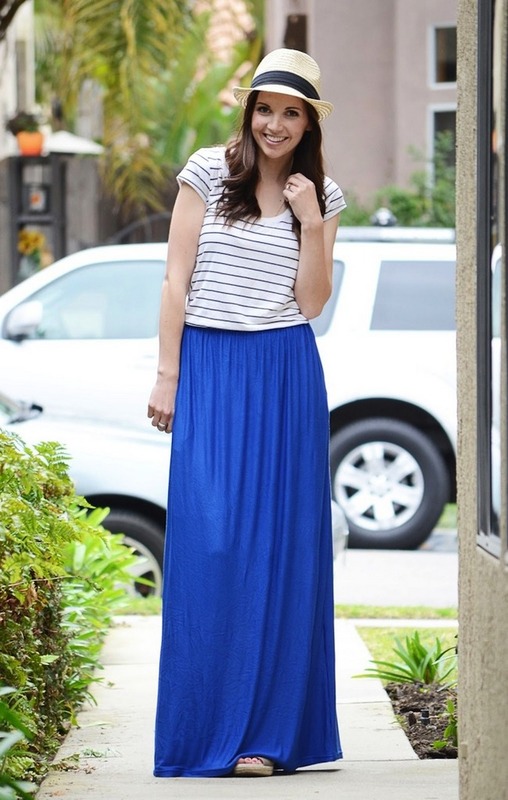 Use a maxi skirt that you own as a length guide, or measure from your waist to the floor and add an inch or two. Make the waist wide enough to allow plenty of gathering. 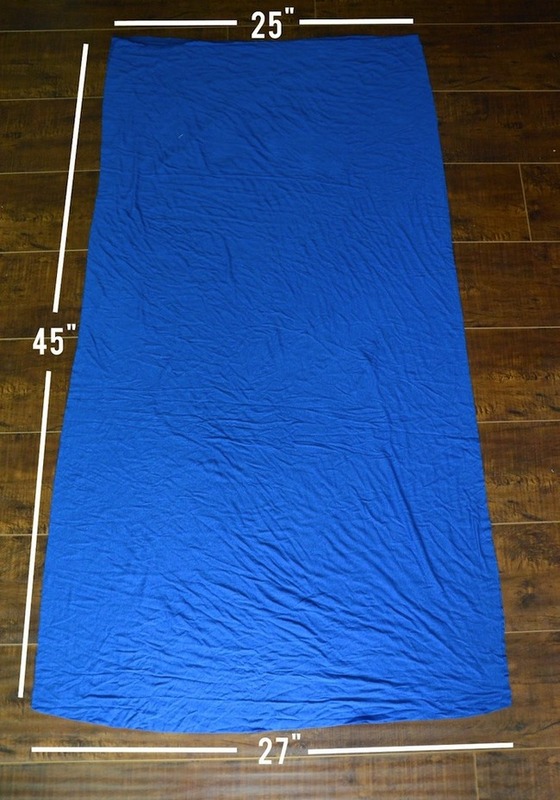 My waist measurement was 25″ across, as seen below, giving me 50″ of material to create the gathered waistband. This much material ended up being perfect. note: I had to stretch my t-shirt a bit in between pins since the skirt waistband was larger than the bottom of the shirt. Step 3. Cut a piece of elastic to the length of your natural waist. Now we’re going to create the casing that will hold the elastic. 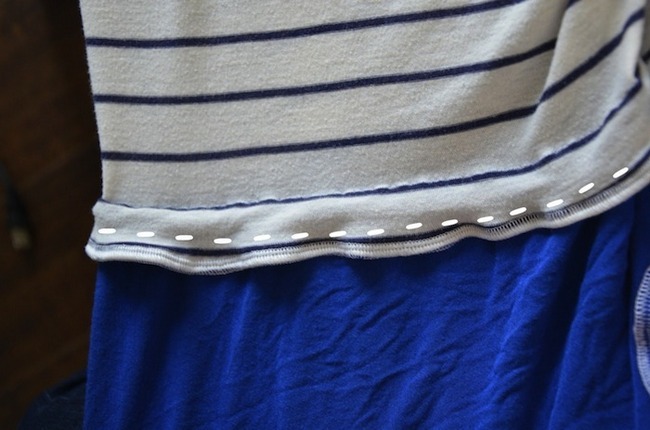 On the large seam allowance (seen in the photo below), sew another straight seam roughly 1/4″ or 1/2″ below it* (depending on the width of your elastic). Make sure it’s just slightly wider than the width of your elastic so the elastic can fit through the casing but won’t slide around once it’s in there. Leave a 2″ opening at the end of your seam so you can insert the elastic. We’ll sew it closed at the end. *make sure you’re sewing through the seam allowance AND the skirt…not just the seam allowance. The space in between these two fabrics is what will create the casing. Step 4. Attach a safety pin to the end of your elastic and use it to feed the elastic through the casing. Once the elastic is completely through the casing, sew the ends together to make the elastic a large loop. Now go back to that 2″ opening in the casing and sew it closed. Hem your dress to your desired length. And you’re done!